March 7, 2013 – Steve’s Real Food of Murray, Utah has announced it is recalling its 5 pound bags of Turducken Canine Diet 8 ounce patties due to potential contamination with Salmonella. The product is sold in 5 pound green and cream colored bags with lot number 209-10-27-13 and an expiration date of October 27, 2013. In addition, there’s a risk to humans from handling contaminated pet products — especially if they have not thoroughly washed their hands after having contact with the products or any surfaces exposed to these products. If your pet has consumed the recalled product and have these symptoms, please contact your veterinarian. The potential for contamination was noted after a routine sampling of one 5 pound bag by the Minnesota Department of Agriculture. Production of the product has been suspended while the company and the FDA continue their investigation as to the source of the problem. Consumers who have purchased 5 lb. 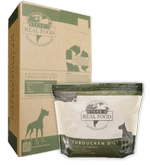 bags of Steve’s Real Food Turducken Canine Recipe are urged to return them to the place of purchase for a full refund. Consumers with questions should contact the company at 801-540-8481 or [email protected] Monday through Friday from 8:00 am – 5:00 pm MST.